Access to many oropharyngeal tumors has traditionally been through a transmandibular, translabial approach or a wide pharyngotomy. Unfortunately, mandibulotomies and large phayngotomies can result in significant postoperative morbidity and functional and esthetic compromise. Because of the morbidity involved in these more aggressive resections and the proven efficacy of chemoradiation in the treatment of some oropharyngeal cancer, there was a paradigm shift away from ablative surgery. As long-term follow-up on these “organ-sparing” protocols has taken shape, however, significant morbidity and mortality has emerged. 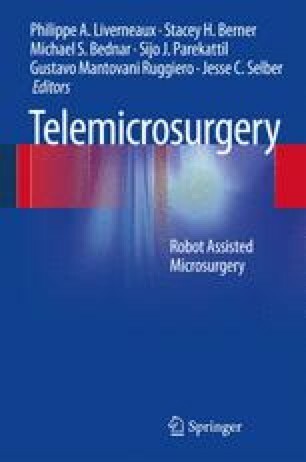 Transoral robotic surgery (TORS) was developed to resect tumors in the oropharynx without splitting the mandible. It has the benefits of locoregional control while avoiding the morbidity of high-dose chemoradiation therapy. The reconstructive challenge created by these minimally invasive resections is that the cylinder of the oropharynx remains almost entirely closed, severely restricting access to oropharyngeal anatomy. For these types of defects, transoral inset of a free flap or local flap using robotic assistance has been shown to be both feasible and effective. By taking this approach, the plastic surgeon can provide the reconstructive support for the head and neck surgeon to remove larger and more complex tumors robotically that would be very difficult to reconstruct through traditional methods.